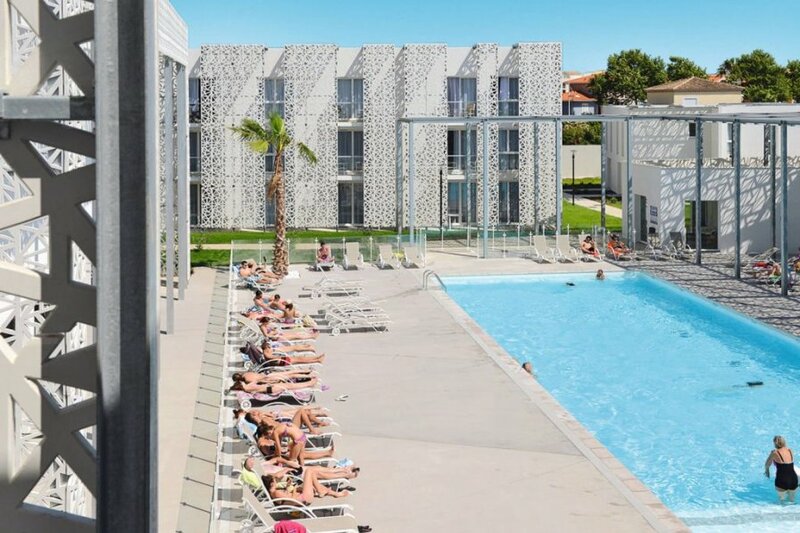 This 1 bedroom apartment with swimming pool is located in Le Grau d'Agde and sleeps 6 people. It has WiFi. The apartment is within walking distance of a beach. Apartment, 4 - 6 people, 2.5 room/s, 1 bedroom/s, 1 bathroom/s, approximately 38 m², 1 floor/s, apartment on ground floor or upper floors, year of construction 2015. Feature: Property in a holiday complex (141 units in total). € 0.20 per person and day (depending on occupancy). Final cleaning by tenants or against payment, € 75. Holiday resort tax. Linen/towels available. Deposit € 500 (in cash, Visacard, Mastercard). Cot/​High chair/​Baby bath only within the maximum occupancy, each € 25 per stay (on order). Pet 2 animals allowed, € 10 per pet and day or € 50 per pet and stay (please advise prior to arrival). Access/parking: parking in the holiday complex (depending on availability); parking outside the holiday complex (depending on availability). Estate (shared use with holiday guests): (electric entrance gate), trees, with garden, lawn. Pool (shared use): 20.0 x 10.0 m, open throughout the entire season, depending on the weather, children's pool. Pool area: tiled, deck chairs (included / depending on availability), sunshades (included / depending on availability), external shower. Infrastructure: reception service several hours only; washing machine (coin-operated); dryer (coin-operated). The agent describes this apartment as a family friendly holiday rental ideal for the summer holidays. It is also good value for money. This apartment is located in Le Grau d'Agde. The nearest airport is only 13km away. It is set in a very convenient location, just 0 metres away from a beach and only 500 metres away from the city center.